.. The recent oscillations in temperature and precipitation have 'gentlified' our anticipated robust runoff episode - but just briefly. .. Our neighborhood Madison River is showing signs of rambunctiousness. .. It is running at about 300cfs above seasonal norms. The river is bank full and beginning to become very colorful. .. In-water visibility is about four feet and darkening by the day. We've been getting some spittings of rain and an occasional cloud full of graupel. It's good for the garden. .. It looks to continue it's exuberant ways for the next week or ten days. .. It is overbank in a few areas and promises to water the grass in many low lying areas. .. 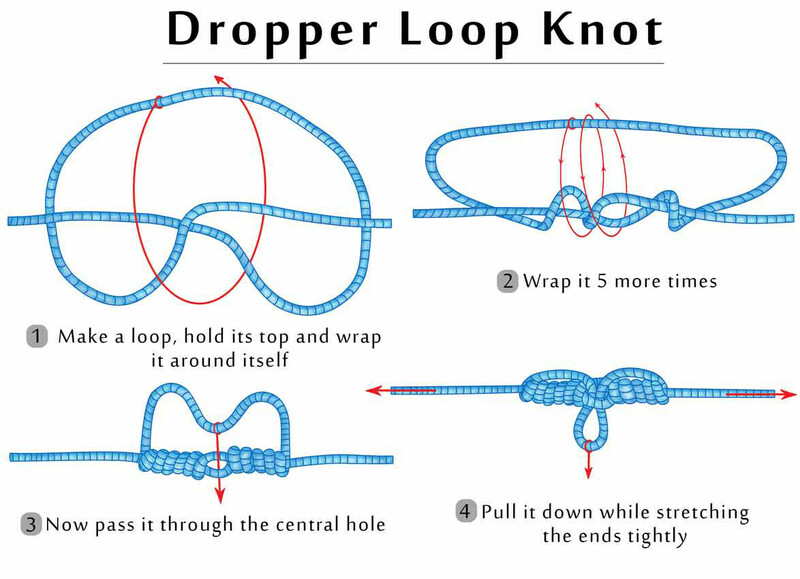 This level of flow will jiggle the river bottom. Small boulders will move around. Sand, silt, and clay will be redistributed. Don't count on standing in your favorite footholds and repeating last year's glorious slaughter. .. 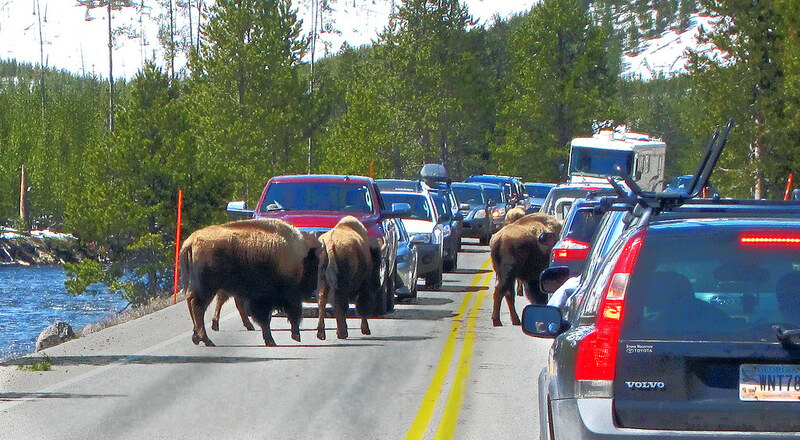 IMPORTANT: The National Park Service traveling road show will be in West Yellowstone tomorrow. .. Read all about it HERE. .. We're likely in for some garden time today. Composted manure under the fingernails makes for some tasty noon time pizza. 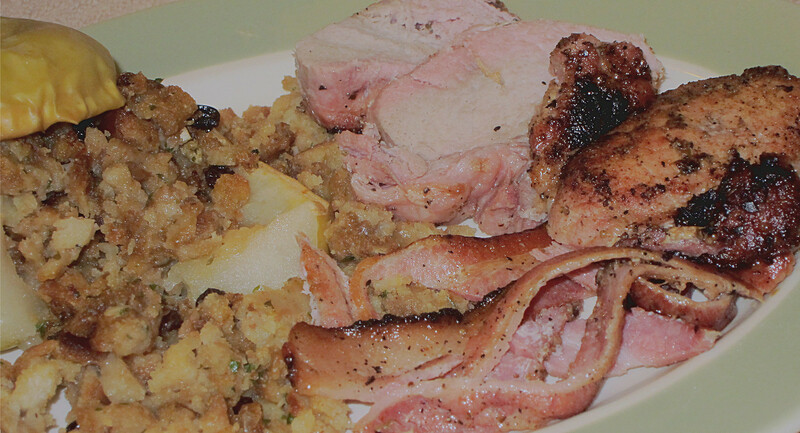 Bacon wrapped pork medallions with savory stuffed apples. .. 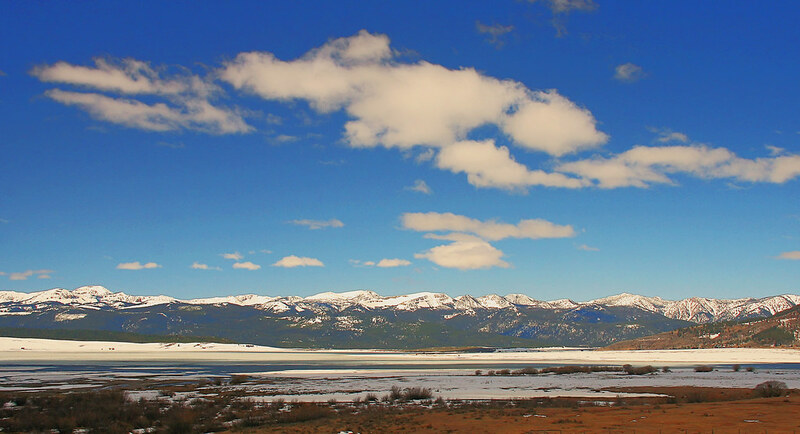 The neighbors are already on Hebgen Reservoir - the edges are opening up. .. Tactics are varied, as are the foods. Yes, there is a hatch. Yes, there are nymphs. Yes, there is a debris rain. Yes, the trout are still in pods. Yes, the fish will eat sticks. .. Estuary waters beyond lake margins are now legally open for fishing. The gear folks are stocking the freezer and anticipating some grilled trout. 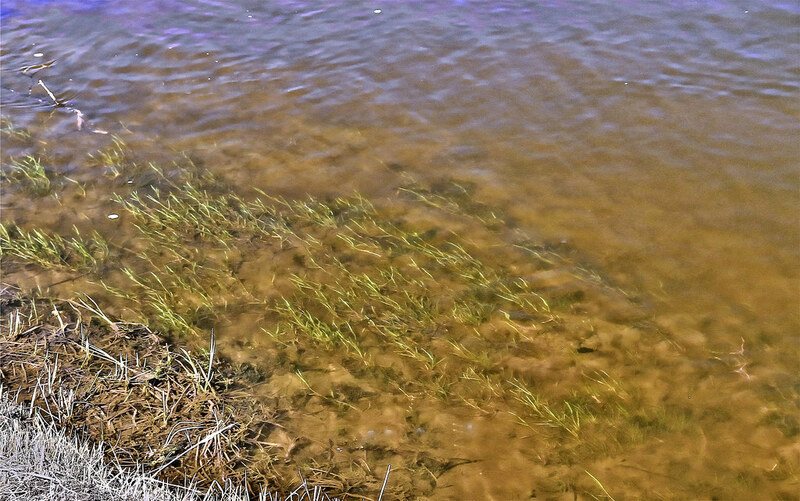 Whitefish are still active near the shore and smoking is still in the offing. .. 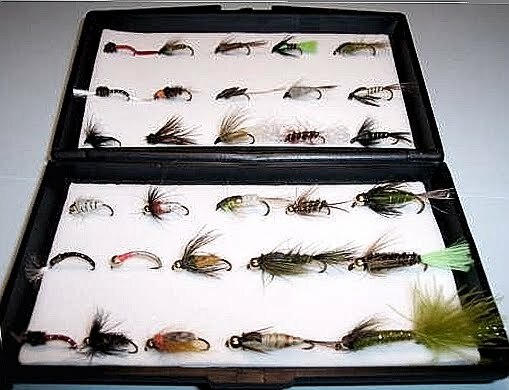 Single sinking flies or, single floating flies or, two floating flies or two sinking flies or, one of each - 'topper & dropper,' are all rigs that work. .. Right now the neighbors are split between the topper & dropper rig and the two sinking flies rig. Both are productive. .. If you decide on a topper & dropper be sure that the surface fly is buoyant enough to keep itself on the surface with it's submarine companion. Bobbers are a viable option with any rig choice. .. We suggest that, with the sunny and warm weather currently gracing us, now is the time to get with it. .. As soon as the tributary creeks hit full runoff and the ice begins to recede the shoreline fish will fall off. Hardy souls will have belly boats and tube yachts in the water within the next 10 days. .. At this point in time the fish are hungry, terribly non-selective, very active, and enthusiastic for willing dance partners. .. 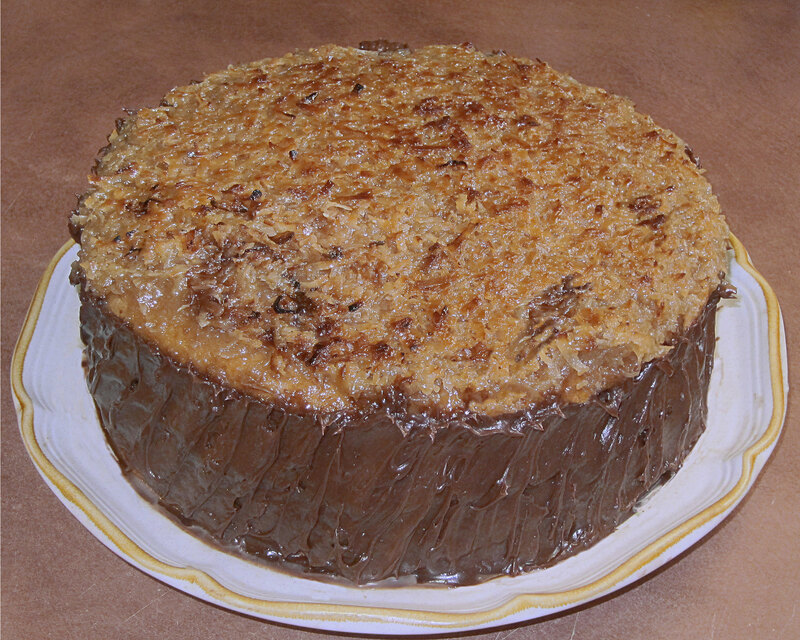 It does not take an enormous amount of stuff to fish the edges. A few surface flies, a few sinking flies, and a bobber or two will suffice. .. A slow sink tip line will find the depth of the feeding zone for sinking flies. Watch carefully for any jiggle of the floating section. .. Don't catch them all! .. Off we go. If the breezes are light after our garden chores we'll hit the shoreline later this afternoon. Can't let that ice edge escape. 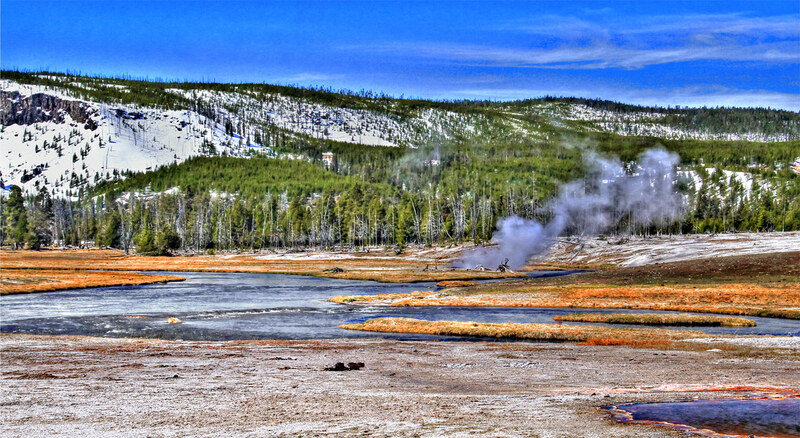 ..Here's a Yellowstone National Park news release. Take it for what it's worth. >> MAMMOTH HOT SPRINGS, WY – Yellowstone National Park staff will travel to nearby communities to talk with anglers and other interested individuals about ongoing efforts to restore native fish species, the threat of aquatic invasive species, and the park’s fishing regulations. -- Monday, April 30, in Bozeman, MT, at Hilton Garden Inn, 2023 Commerce Way. -- Tuesday, May 1, in West Yellowstone, MT, at Holiday Inn, 315 Yellowstone Ave.
-- Wednesday, May 2, in Jackson, WY, at Wort Hotel, 50 N. Glenwood St.
-- Thursday, May 3, in Cody, WY, at The Cody Hotel, 232 West Yellowstone Avenue. 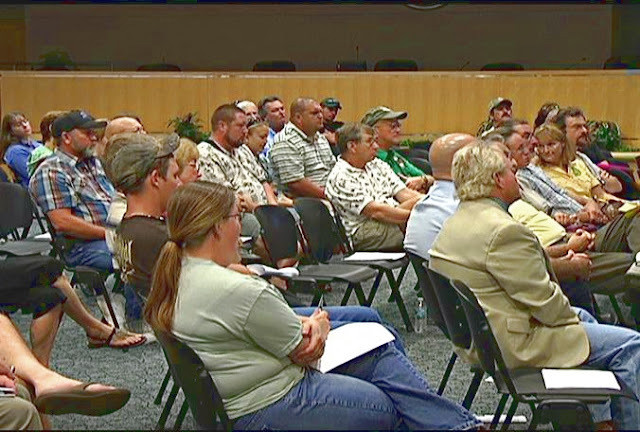 >> The meetings will begin at 7 p.m. with a brief presentation about native fish restoration projects. A discussion on angling regulations and a question and answer session will follow. 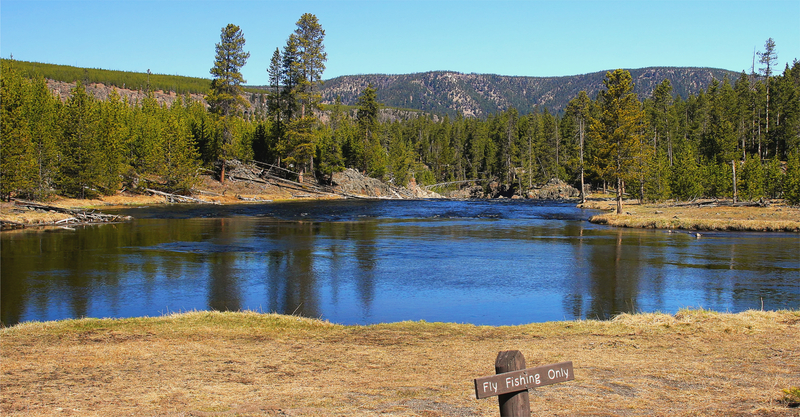 The meetings will conclude at 8:30 p.m.
>> Fishing season in Yellowstone opens Saturday, May 26. 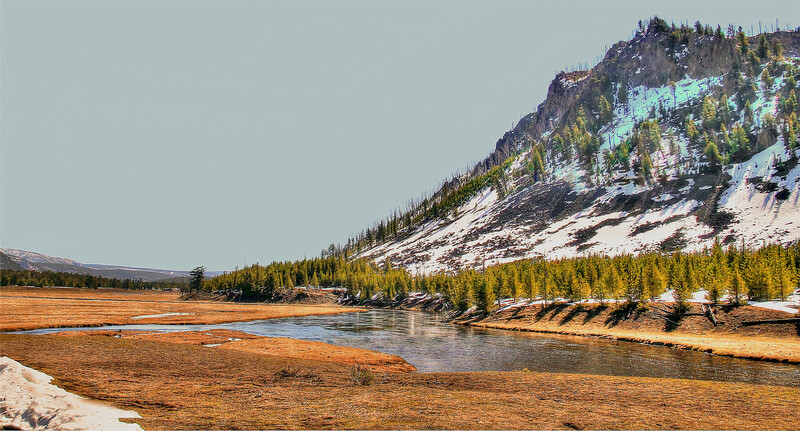 Information on fishing regulations, fisheries science, and fish conservation in Yellowstone is available at http://go.nps.gov/fish. .. So our rain turned to snow and dampened the neighborhood. .. We'll have 50's merging into mid 60's for the rest of the week. .. Best get your pre runoff fishing in soon. There are still some midges. There are lots of stonefly nymphs = all sorts: big ones, little ones, black ones, yellow ones. .. 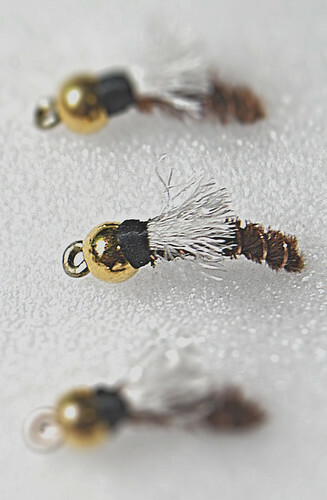 Grab a handful of the reject flies from this winter and scrunch them up good. Sink 'em and hang on. .. 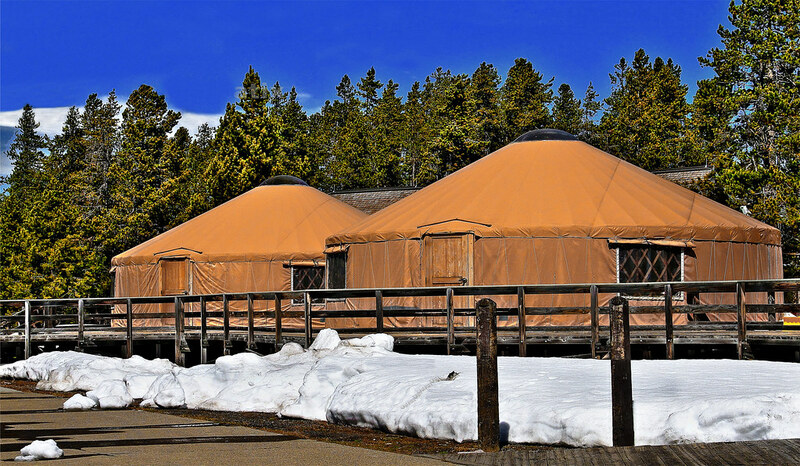 This year opening weekend for the west entrance of Yellowstone Park was gentle and welcoming. .. The sun was out, the breezes were gentle, the visitation was sparse, the critters were on show and a good time was had by all. .. Flows on both the Firehole River and the Madison River are up and both rivers are running bank full. .. With the current warm up and the remaining snow pack we anticipate that they will be over bank within the next 48 hours. .. Color is moving into the Madison River and is reminiscent of the stain in a wee bairn's nappies. .. Visibility is about four feet and not as turbid as we anticipated. It would be possible to fish the water with out too much anxiety. .. The only color in the Firehole River is the slight glacial blue of fine to medium silts. Under the clear sky this produces a tanzanite hue that is striking for this time of year. .. This time last year there was no low level snow cover below the Madison Plateau. .. This year there is still a couple of feet, (give or take,) on the meadows and under the trees. .. We anticipate that this will enter the runoff very soon with the warm rains invading the neighborhood. .. At the elevation of Old Faithful the snow is over two feet deep in the north corners and shade. .. The normal rush of neighbors to the west entrance was muted this year == probably due to the snow cover and errant weather forecast. .. In town there was a slight up tick in feather merchant traffic. 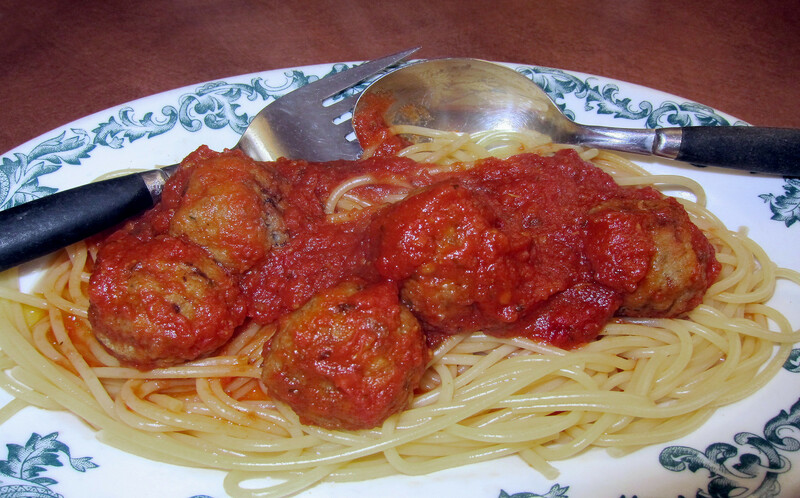 The restaurants were easily invaded with no lines and empty tables. .. There is still a plethora of parking spaces in front of the occasionally open trinket shops. .. After another winter the park is in the same place that it was last year: we're elated. .. The maintenance crews have cleared all the dead fall from the roads and posted all the appropriate bear warnings. .. The bears will linger a little longer in the valleys this year; waiting for the exposure of the dead meat of winter. 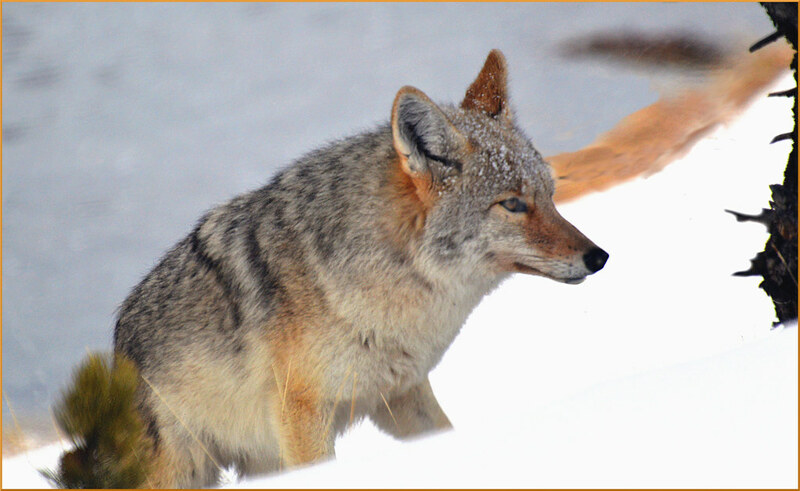 The ravens, coyotes, and eagles have already dug into the proud flesh of Spring. .. With our early park-fix out of the way we now have time to dabble in the postage stamp sized bit of dirt that passes for our garden. .. There is still some snow to be removed and then a bit of digging prior to planting. Perhaps it will happen soon: we'll see. .. 3/4 of a century may seem short to some and long to others. 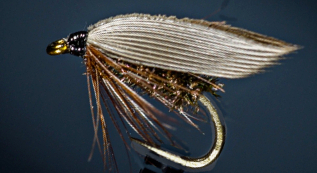 The modern dry fly movement is just turning 125 years old, (short to some - long to others.) It is, in the modern mind, the "TRADITIONAL" way to fly fish. .. 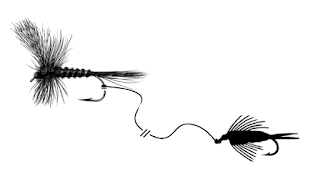 Prior to the adoption of floating flies, (for centuries and even millennia,) the traditional and, accepted way was to fish with a sub surface fly. 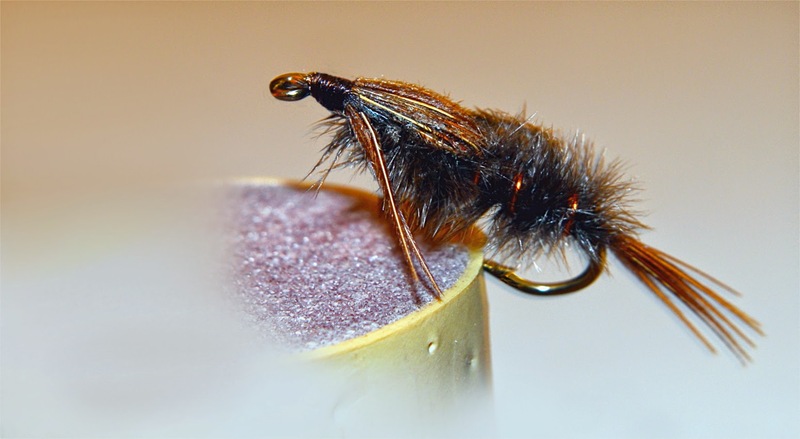 .. As with all flies and with all tiers the flies evolved and became standardized as the classic wet fly. .. 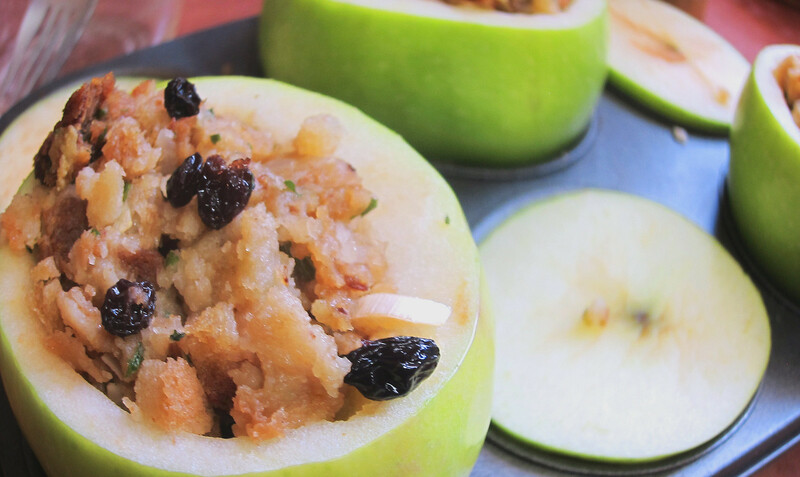 Almost immediately after the standardizing of this morphology variation crept into the recipes. .. Soon the shorthand vernacular of fly fishing took over and called everything that was sunken a wet fly. 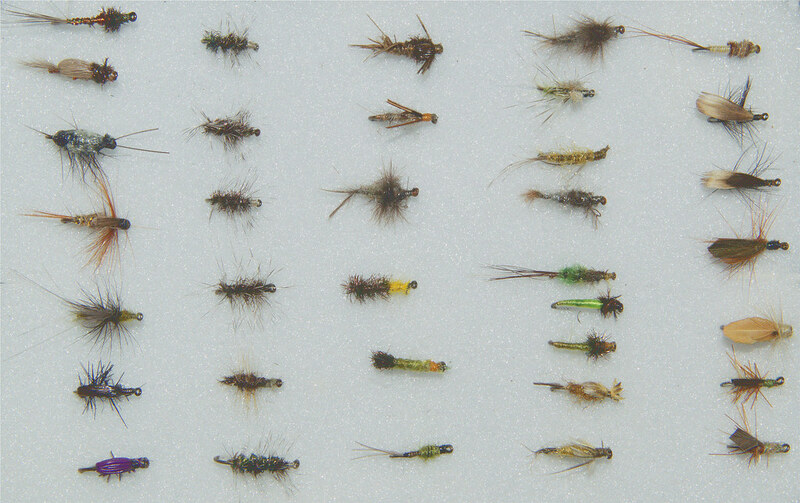 .. About the time of fly standardization came the interest in sub surface trout food. .. Patterns began to be imitative of what was found in the belly's of trout and what lived under rocks. .. Nymph patterns became popular. These proliferated as information and imagination took hold. .. Some of these patterns were highly imitative and others were extraordinarily impressionistic. 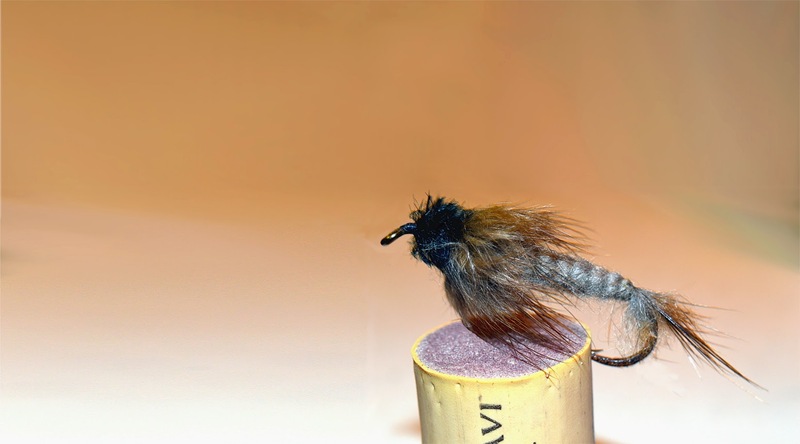 .. About the time that the subsurface tradition had evolved into the accepted, and standardized way to take a trout, along came the floating fly techniques. At first it was just any fly on the surface of the water. 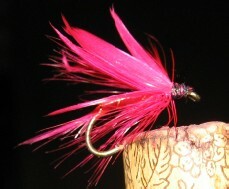 .. Again, information and, innovation and, imagination served to contribute to the patterns of floating flies. .. 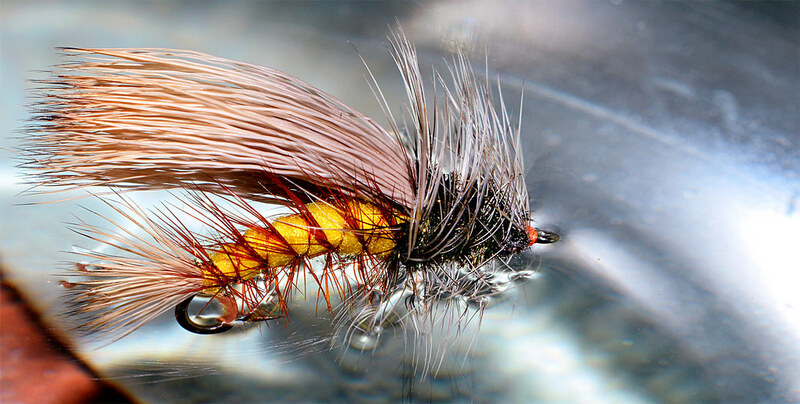 The modern dry fly is now considered traditional and classic. .. 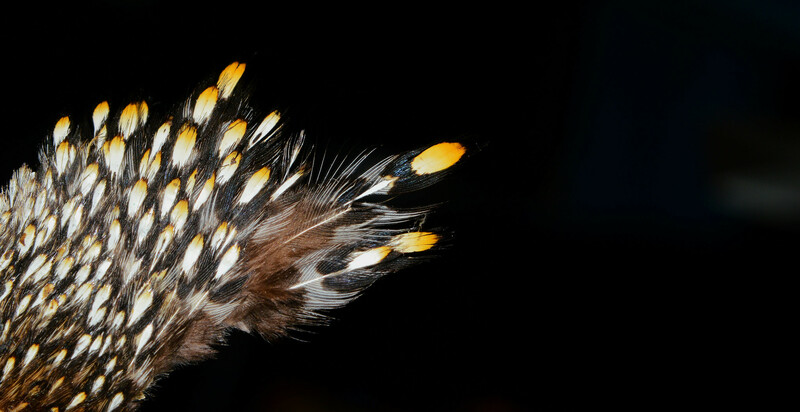 The art of the dry fly has become a bit of voodoo hocus pocus in the modern fly fishing fraternity. It is the 'holy grail' for many fishers. .. That's a whole different story. .. 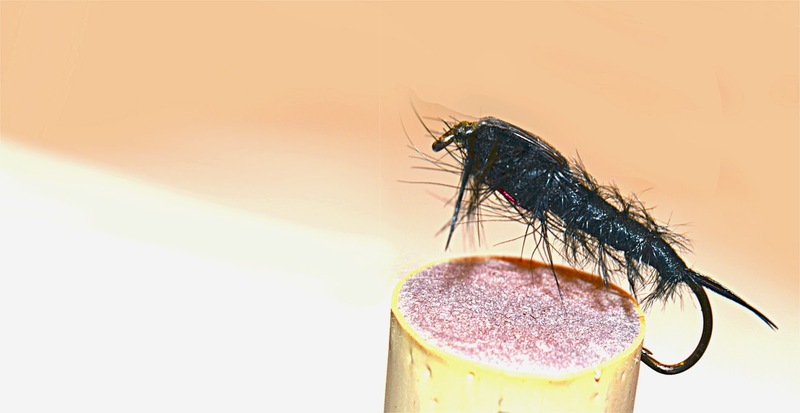 Recently there has been an interesting resurgence in fishing sunken flies. .. 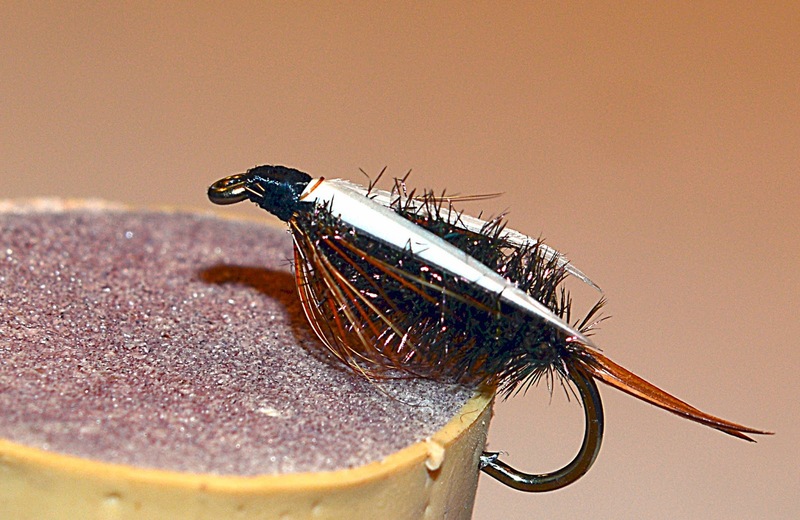 The wet fly and, particularly the nymph, is gaining in popularity: for many reasons, we suppose. .. Properly fished the nymph will catch more fish than any other sort of fly. There is also a mystery about the 'take' of a nymph. Is it the bottom? Is it a fish? .. Without the advantage of seeing the take there is much finesse, technique and, luck involved in galling a fish with a subsurface fly. .. 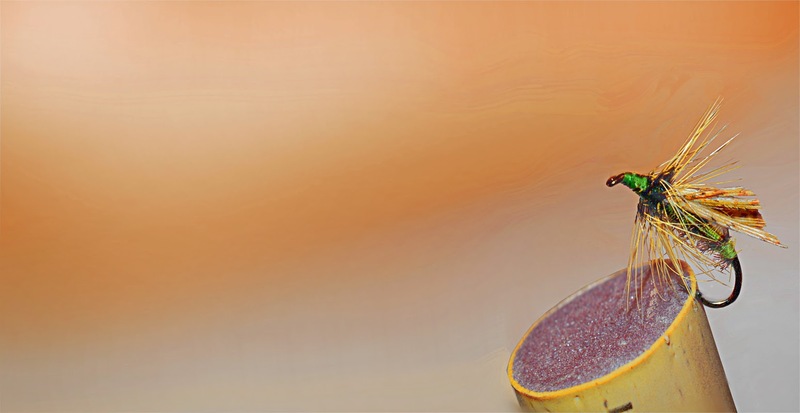 There are only a few tips that need be elucidated to ensure that success is achieved in nymph, (or other subsurface,) fly fishing. .. First off it is important to look under rocks. That's where the year round food supply is. .. Big ones, little ones, cased ones, wiggly ones, crawly ones, and even fixated ones all can be found there. Pick something from your box that is close to what you find. 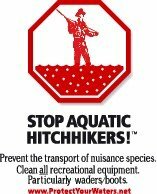 .. Be sure that your fly line is exceedingly clean and well dressed. 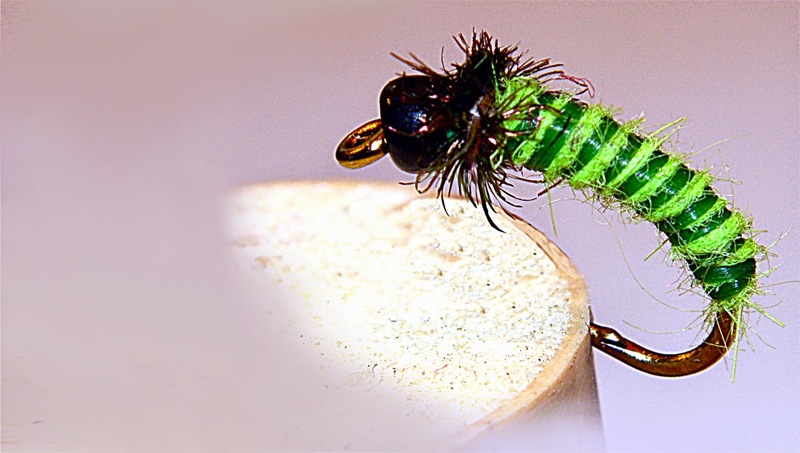 It must float high, be easily mended, highly visible, and of the proper taper to deliver the nymph. Long casts are not necessary; most of the time. .. Drift is very important. Weight should seldom be used. Line mending is a nearly lost art. 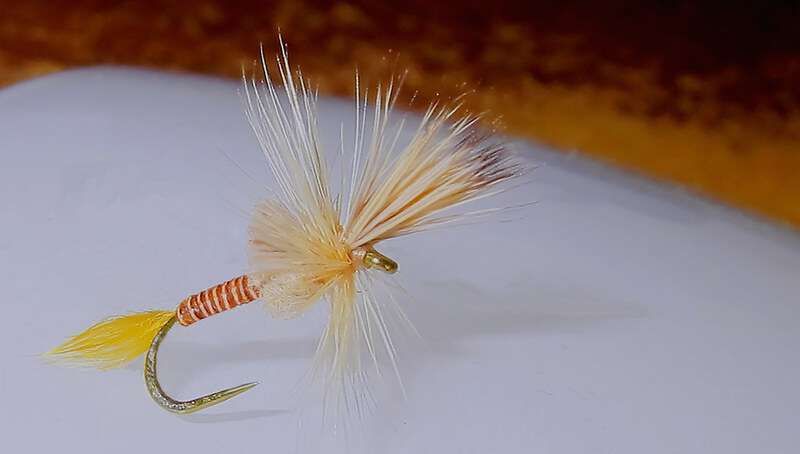 The roll cast and water load are nearly forgotten - even with the currently popularity of Spey Techniques. .. Bobbers, (strike indicators for the effete,) are not really necessary - even though they can help. 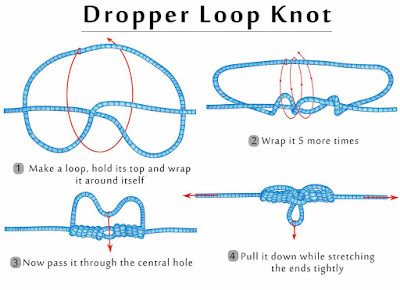 Double bobbers are even used. Yarn is nice. Foam works but is environmentally insensitive. .. During the last year or eighteen months - or so - buzz in town and in the dark corners of pubs has been heard using subsurface vernacular in animated conversations. .. Most of our neighbors are accomplished sub surface fishers. Most visitors are either preconditioned to or, sucked in to, floating fly fishing by local counter help. Missing lots of fish on the surface makes it seem hard to catch trout. .. For some "hard" is the challenge. So be it. 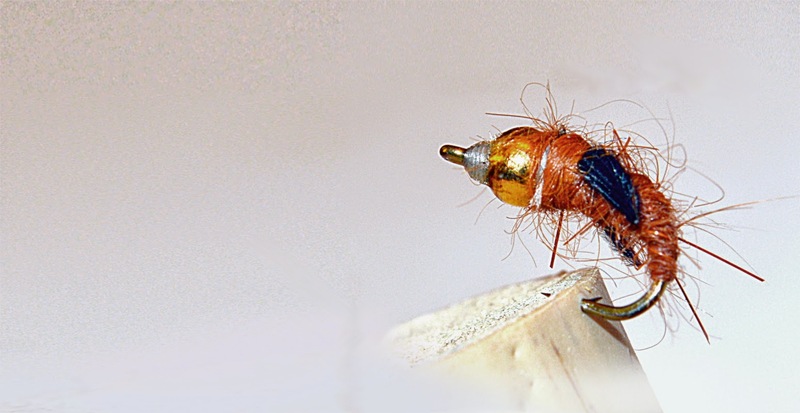 .. About a year ago Tom Rosenbauer, (from Orvis,) bucked the trending 'Great Spey Revolution' and produced a very informative video about nymph and wet fly fishing. If you would like to catch fish all day long it is well worth your time to view it. .. It's another sunny day and, as they say around here: "We're down to dirt." There are still piles of snow in the corners and lining the streets. Some are 10' tall. .. The kids are back on their skateboards. We anticipate about five or six days of 50°F temperatures. There may be some drizzle too - the melt will soon be in the creeks and rivers - the color cometh! .. We have just enough time for a brief nap and then some wandering along the muddy shores of Notellum Creek. .. It may seem like a small victory but it is very big in terms of public participation. 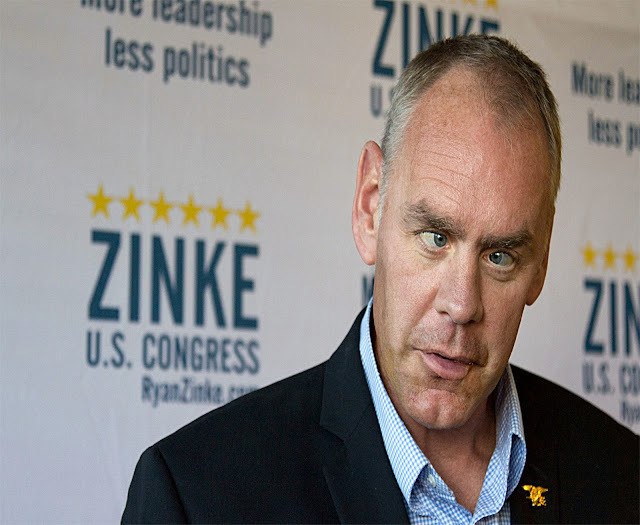 .. Last October, (when he thought no one was looking,) Zinke directed the National Park Service to jack up park entrance fees. .. Surprisingly a public comment period was available. The public, (you good folks,) came through with one of the largest responses in NPS history. .. A revised fee schedule has been adopted by the NPS and, Secretary Zinke is claiming credit for listening and acting - ho, ho, ho. .. A $5.00 increase -- from $30.00 to $35.00 -- per vehicle / per visit will be the new fee. This is in line with other more recent increases that have been levied. .. Most of the rate hikes take effect June 1. The $35 fee applies mostly in the West and will affect such popular parks as Yellowstone, Zion, Bryce Canyon, Mount Rainier, Rocky Mountain and Grand Teton parks. .. Be sure to check the website of the park you intend to visit to see if the fee structure has changed. .. The snow is still coming down. Small dry flakes are wafting through the trees and piling up slowly. .. The warm streets are slushy and the drains are keeping up with the runoff. .. The neighbors have swept off the grill and plan some burned meat as we look toward the coming melt down. .. We anticipate 50°F in a day or so. The sun will shine and, the wind will blow and, the neighborhood kids can get back on their skateboards. - YEE-HA! .. Our mid life morning turned into a baking frenzy, (must have been the coffee.) Such is life in the realm of the maturizum. Here Today . . . . 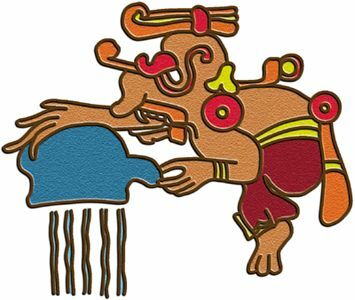 Praise Chaac the cool snow continues. amounts up to 16 inches in the mountains. * WHEN...From 11 AM this morning to 6 AM MDT Friday. exceed one inch per hour at times. Cold Air Advisory for Newborn Livestock. .. Just a small adjustment in the daily plans: we expected a dusting based on local forecasts - we're getting a foot or more. .. The one problem with the weather forecasters in Montana is: they have no windows in their offices - oh well. .. Breakfast was good. The second pot of coffee was as good as the first. .. We'll stay closer to home and fish in the bright mid day snows.